Fennel is an aromatic plant with smooth feathery spiky leaves and grows to a height of 2.5 meters. During its lifetime, the plant has pale green hollow stem and develops bluish green bushy branches. The scientific name of fennel is Foeniculum vulgare and the plant is grouped under carrot family. The small yellow flowers of fennel bloom into umbel shaped bunch (like an inverted unfolded umbrella without the central shaft). The plant grows from the white bulbous base which is used as vegetable. The leaves, fruits and seeds are known for their strong aroma. Reproduction of plant takes place by propagation of seeds by wind. Fennel leaves are cooked either isolation or in combination with other leafy green vegetables in India. Fennel is also used in making herbal tea or tisane. The chopped leaves are used for garnishing and in salads. On account of their rough external texture of the seed-husk, one or two tea spoonful of dried seeds of fennel would be eaten in after dinner to produce grinding effect for easing the mechanical churning/peristalsis of masticated food in the alimentary canal. 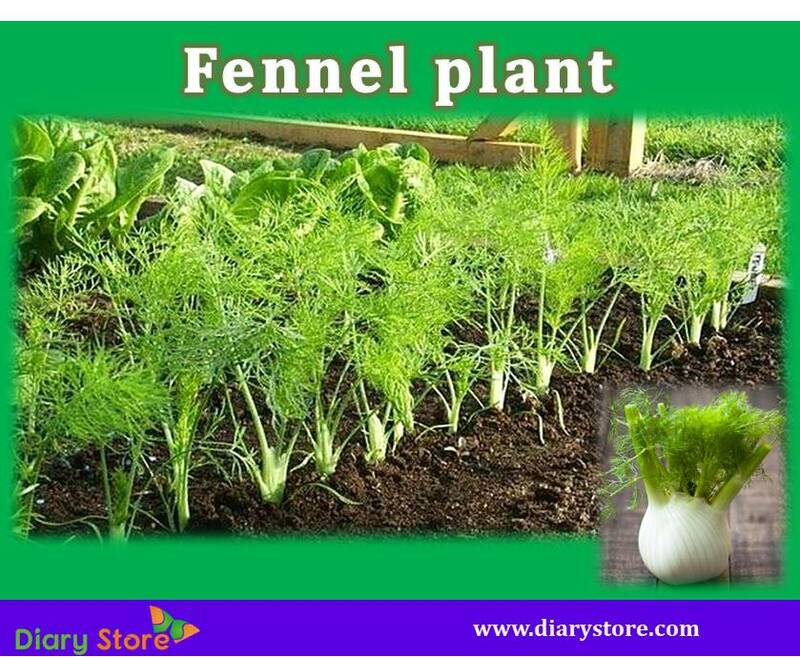 Fennel consists of important elements phosphorous and calcium needed for strong bones. Zinc present in fennel is vital for generation and maturation of collagen, a protein found in bones, muscles, skin and tendons responsible for holding the body together. 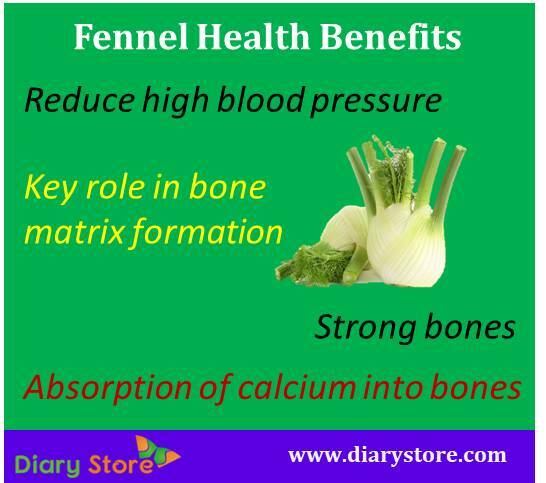 Vitamin K of fennel acts as a medium for absorption of calcium into bones. Fennel contains the mineral manganese which plays a key role in bone matrix formation. While the consumption of table salt (sodium chloride) is discouraged for people with hypertension, the elements like potassium, magnesium and calcium present in fennel are found to reduce high blood pressure naturally without artificial medication and they are known to engage in vasodilation, a process in which dilation and contraction of blood vessels take place. The high fiber content in fennel helps in disintegration and anti-coagulation of cholesterol and allows deconcentration of fats that block smooth circulation of blood. Vitamin B 6 and folate of fennel convert homocysteine (a compound that damages blood vessels) into harmless methionione and thus protect blood vessels. Cell damage by free radicals is averted by the antioxidants like vitamins C, vitamin A and beta-carotene present in fennel. Folate in fennel is a major factor in synthesis of DNA and rectifies malformation in cell structure which might lead to generation of cancer cells by mutation. Killer T-cells (a sub-type of white blood cells) in sufficient number are absolutely necessary which circulate in the body and scan for any cellular abnormalities and infections. Inadequacy of T-cells might break down immunity system and makes human body vulnerable for attack of life-threatening diseases like cancer, HIV/AIDS etc. Selenium found in fennel is reported to generate killer T-cells to strengthen the immunity system. Chlorine is a multi-functional nutrient that induces good sleep, muscular movement and helps in comprehensive abilities and retention power of mind. Transmission of nerve impulses through the neural network, imbibition of energy-giving fats, maintenance of structure of cell membranes and mitigating chronic inflammation are the functions of chlorine. Fennel has chlorine in it. Pre-menstrual syndromes like acne, tender breasts, unexplained fatigue and mood swings might be due to low estrogen levels. Fennel is found to compensate the inadequate generation of estrogen. When fennel along with food rich in vitamin C and iron is consumed, the process of iron absorption into the body is hastened. Fennel is a vegetable in which almost every plant of the plant are used either for food or for medicinal purposes.